Our Mission is to Love God, Love Others and Draw People Closer to Christ. The original parish of 58 families was called “The Catholic Community of Fox Valley” until it was re-named “Our Lady of Mercy” on August 28, 1988. The parish maintained an office in the Fox Valley Commons, and our founding pastor, Fr. Tivy, lived in the Rectory of Ss. Peter and Paul until the completion in July 1989 of the present rectory at 801 South Eola Road. St. Anne’s in Oswego became our second home for celebrating the Sacraments of Baptism, Marriage and Funerals. 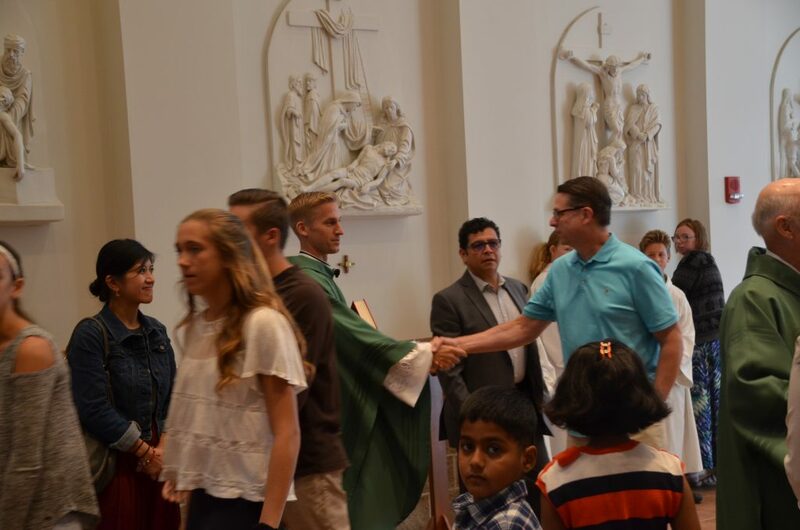 Weekend and Holy Day Masses were celebrated at Waubonsie Valley High School. On September 20, 1997, after years of hard work and dedication, we celebrated the first Mass in our new home, the present church at 701 South Eola Road. A mere decade later, in 2007, our Parish Life Center was completed. It houses parish offices, a large multi-purpose room and meeting rooms for our many organizations and Religious Education program. From our modest beginnings, the parish has grown to approximately 3,900 families. There are more than 60 organizations engaging in a variety of ministries and we are anticipating more than 200 baptisms and 30 weddings this year. Whether you are a new parishioner or just visiting, we hope you enjoy our beautiful church and the wonderful people here at Our Lady of Mercy. Please be sure to let us know if there is any way we can help you on your journey with Christ. The neighboring parishes of Ss. Peter & Paul, St. Thomas the Apostle, St. Raphael’s and St. Anne’s not only provided the founding families for our parish, but were ever so generous in many other ways. Ss. Peter & Paul extended their hospitality by inviting Fr. Tivy to live in their rectory. Our original Processional Cross was made as a result of St. Thomas the Apostle sharing with us what God had given to them. 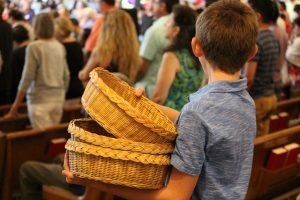 St. Anne’s became our second home for many celebrating the Sacraments of Baptism, Marriage and the Mass of the Resurrection prior to the dedication of our church. Religious Education classes started the week of October 17, 1988 and RCIA (the Rite of Christian Initiation in Adults) commenced October 26, 1988. The first “Coffee and Community” was held following the 9:00 a.m. Mass on October 2, 1988. The first parish organization was the Council of Catholic Women, who had their inaugural meeting on October 18, 1988. On August 28, 1988, John Michael Callahan was the first child baptized in our parish. The Blessed Union of Joanne Huffington and Roy Murphy was the first Sacrament of Matrimony celebrated on November 19, 1988. Thirty-four children celebrated their Sacrament of First Reconciliation on December 12, 1988; the inaugural celebration of the Sacrament of First Eucharist was celebrated when 22 Communicants first received the Body of Christ on April 29, 1989. Kristen Joy Fedder was the first parishioner confirmed at our first Easter Vigil on March 29, 1989. When Fr. Tivy was installed as Pastor, he was assisted by Sister Louise Staszewski, O.S.M. as Pastoral Associate and Director of Religious Education. Deacon Michael Cook and Deacon Robert Schreiner came to us on March 5 and March 12,1989, respectively. Deacon Mike remained until his farewell reception on March 17, 1996. He was reassigned to be Deacon at the cathedral parish of St. Raymond’s in Joliet. Deacon Schreiner was ordained into the Priesthood in June, 1990. Father James Flint, O.S.B., from Procopius Abbey in Lisle, first came to assist Fr. Tivy in February 1990 and remained a Weekend Associate until March, 1994. On October 10, 1992, we were blessed with Father Richard Best and Sister Marianne Talian. Fr. Best is our Weekend Concelebrant and Sister Marianne is a Pastoral Associate and Administrator of Finance. Sister Marianne had been serving the parish from another location as a volunteer from almost the start of our parish. In 1992, Larry Harris began accompanying the choir then led by Maryanne Schweikert. He became Director of Music in 1994, joining the staff full-time as Director of Music and Liturgy in 2001. Father Kieran Okoro was here October 18, 1998 through January 1999 while on an educational Sabbatical from St. Michael Parish in Urualla, Nigeria. Father Al Heidecke was Associate Pastor from early 1999 to July 2001 when he was reassigned to Holy Trinity Parish in Westmont. In June 2000, Father Tivy was named Pastor of St. Joan of Arc in Lisle. We are blessed to have Father Hugh Fullmer, who comes to us from St. Joseph’s Parish in Lockport, as our current Pastor. Kathy Grodsky managed our Parish Office all these years until she left the office in the fall of 2000. In 1997, Janice Cain joined the staff as our Religious Education Secretary. In 1999, the parish nurse ministry program began at Our Lady of Mercy with Marguerite Armstrong, RN, as our first parish nurse. In September 2000, Marguerite left Our Lady of Mercy and was followed by parishioner, Jolene LeRoy, RN. In 2000, Dave Miserendino joined the staff as our Youth Minister for the middle school and high school programs. Heather Domanski served as Parish Secretary from 2001 to 2006. Father Pete Jankowski was named Associate Pastor in June 2001 and remained with us through July 2004. We were fortunate enough to have Bob Vavra, our first deacon, move into our parish in November 2001. In the summer of 2002 we saw a lot of changes in staff with the introduction of Jean Bohr as our new Director of Religious Education, and Debbie Moen and Diane Reiter as our new RE secretaries. Janice Cain moved from the RE office to become our new Business Manager. In August of 2003, Jean Rehmer joined the Religious Education staff, replacing Debbie Moen. On September 13, 2003, Phil Rehmer was ordained a permanent deacon. Deacon Phil was the first ordained deacon from our parish family. Fr. Show Reddy Allam arrived from India as our new associate pastor in the summer of 2004. We were blessed to welcome our newest Deacon, Tim Kueper from our parish family in September of 2005. In October of 2005, Anne Valdez of the Parish Life Campaign office relocated to Texas. Diane Reiter moved from the RE office to assume her position and to support the business office. Jean Rehmer assumed Diane’s position as secretary for Youth Ministry and Cheryl Lohse came to us from Annunciation Parish in Aurora as our newest RE secretary. In July of 2006 Mary Dunbar joined us as our new Parish Secretary. She retired in the Winter of 2015. ​In January of 2016, Diane Reiter took over as the parish secretary. Ms. Candy Rice joined the staff to coordinate the Middle School Youth Ministry in August 2007. She retired in 2012. In 2012, Mr. John Werle joined the staff as the Middle School Youth Ministry Coordinator and Fr. Lad joined us as parochial vicar. In 2013, Tony Martini was ordained deacon for service at OLM. Deacon Art Tiongson also moved to Texas, but now has returned to our staff at OLM. In 2016, Michael Plese was ordained deacon for service at OLM. In June of 2017, Deacon Tim Kueper retired as the Director of Religious Education, but remains a deacon at the parish. John Werle also retired as the Middle School Youth Ministry Coordinator. In June of 2017, Fr. Hugh Fullmer retired as pastor of the parish after serving in that capacity for 17 years! Fr. Lad also returned to India to serve as a pastor. In June of 2017, Fr. Don McLaughlin took over as pastor of the parish! Newly ordained Fr. Mark Bernhard joins the parish as parochial vicar. In July of 2017, Karen Boyle took over as the Director of Religious Education for Grades K-5 and Candy Rice returned to serve as the Middle School Youth Ministry Coordinator. In August 2017, Janice Cain retired from her role as business manager of the parish. Bob Gancarz will be taking over as the new business manager. In September 2017, Our Lady of Mercy started to serve as a “teaching parish” for Mundelein Seminary. 2017 was a year of staff changes at Our Lady of Mercy. Father Lad Koilparambil returned to his home in India on May 23rd. Father Hugh Fuller, our Pastor for 17 years retired in June. Deacon Tim Kueper retired from his position of Director of Religious Education and John Werle left his position as Middle School Youth Ministry Coordinator. Candy Rice returned to OLM as the Middle School Youth Ministry Coordinator. June 21st brought two priests to OLM. Father Don McLaughlin became the third Pastor at Our Lady of Mercy and the newly ordained, Father Mark Bernhard, as the Parochial Vicar. In August the Business Manager, Janice Cain, retired and Robert Gancarz assumed her position. In February 2018, we welcomed Senovio Sarabia, Jr. as our seminarian intern for the spring semester. In March 2018, Anna Morgan who works part-time as an accounting assistant resigned as her husband has taken a new position downstate and Lydia Schmitt assumed that position. In June 2018, Mary Jo Trapani joins the staff as the new Director of Religious Education. The first Parish Council had the primary mission to establish the new parish and to construct a suitable place of worship. On August 17, 1996, Bishop Roger Kaffer, Auxiliary Bishop of Joliet, conducted the Ground Breaking Ceremony for the church building. On May 5, 1997 after the 4:00 p.m. Mass, as parishioners and staff recited the “Angelus” and looked on, Bishop Kaffer dedicated the three bronze bells that were hoisted into the towers. On September 20, 1997, this mission was fulfilled with the dedication of Our Lady of Mercy Church. In 2001 planning and fundraising for a Parish Life Center began. We needed a place to house parish offices and for organizations and religious education classes to meet. This wonderful facility opened in late spring of 2007 and serves as a center for the many faith-based activities of our parish.